To prepare the leaven, dissolve the yeast in the warm water and add a spoonful of flour. Let rise for 10 minutes. Pour the flour into a bowl, make a pit in the centre, then add the salt, oil and yeast. Mix together well, then kneed and stretch the dough for about ten minutes. When it is flexible, allow the dough to stand in a floured bowl covered with a cloth, in a place that is at a temperature of 25°C. It should double in volume. Fold the dough over itself and then place it on the floured work surface to roll it out with a rolling pin. Give it a 5mm thick disk shape. Lightly flour the pizza baking tray and place the dough on it. Pre-cook the dough for 5 minutes closing the hood; the dough should become white. Slice the mozzarella and the tomatoes (remove the seeds). Spread a thin layer of tomato sauce over the dough, place the slices of tomato and mozzarella cheese on top, then drizzle with olive oil. Close the hood and bake for 4 to 5 minutes. 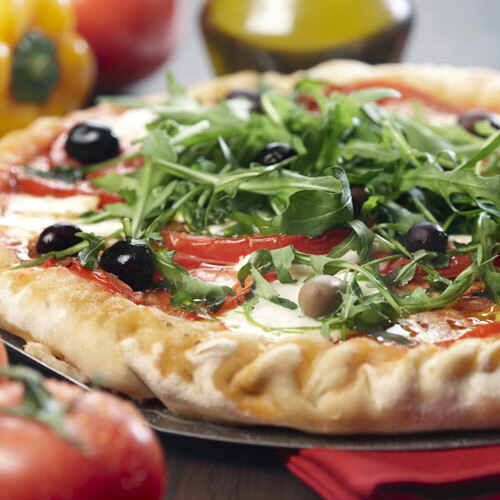 Remove the pizza and then add the olives and salad rocket (arugula). The yeast must not be mixed with the salt. You can add fresh thyme or sage to the dough. To add a little taste to the tomato sauce, you can sauté 2 cloves of fresh garlic in a pan with a little olive oil on low heat. Then add the tomato pulp (400 g packet) together with a tablespoonful of caster sugar and add salt. Cook 15 minutes over low heat and mix everything together. Mozzarella di Buffala does not withstand heat shocks well, it becomes elastic.